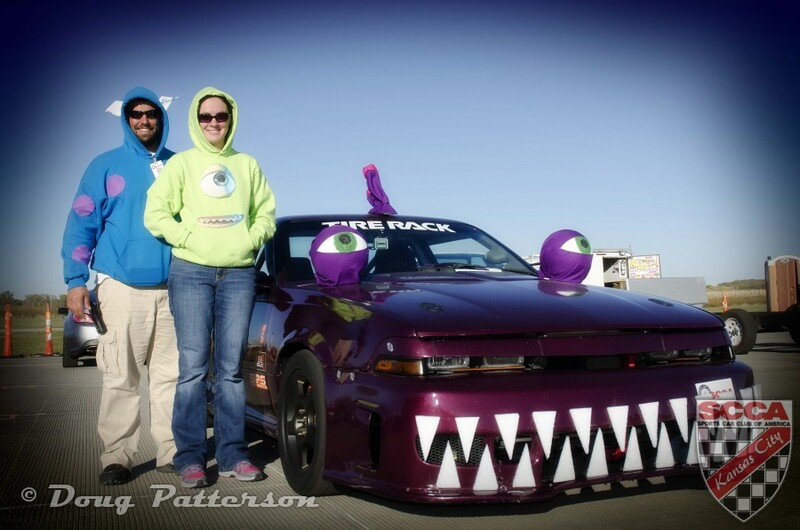 Every year, the Kansas City Region SCCA SOLO program runs its last event with a Halloween theme. This year was no different. With 124 registered drivers, about 15 of which were walk up registrations, the 12th and final event of the year was the largest of the season. More than a handful of those were first time entrants, and I’m sure many of them will be back next year. 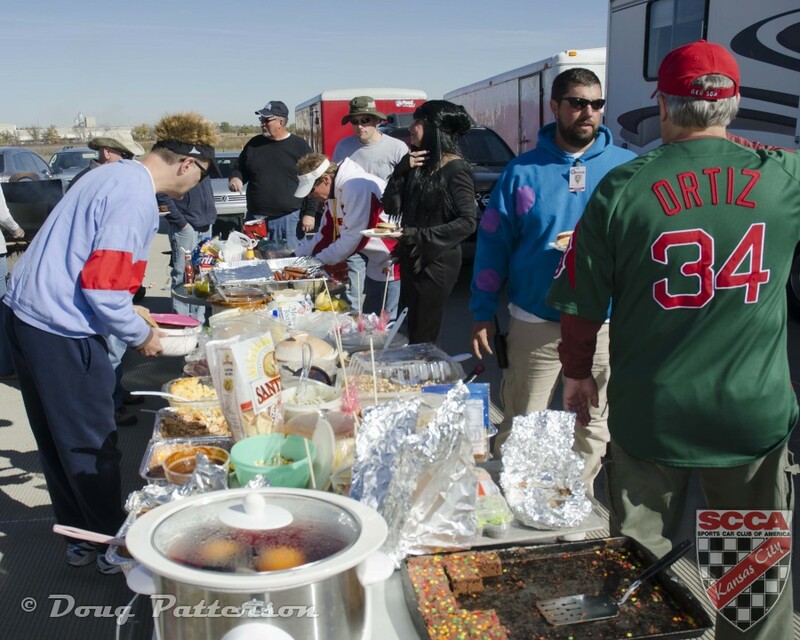 In addition to the SOLO racing, there was a costume contest, a 50/50 raffle, a silent auction, and a pot-luck meal. To say the least, it was a busy event. Course design was done by Jeff Bartz, and all the elements were given a name with a Halloween inspiration. The “Hangman’s Noose” started off the fun with a somewhat tight loop, then lead into the “Spiderweb”, an optional four cone slalom followed by an optional wall element. The “Witch’s Brew”, a decreasing radius sweeper, proved to be an interesting element for some, and “Zombie’s Revenge” lived up to its name, starting with a straight forward sweeper into a near death left turn through the finish gate. I overheard some people saying they got “stuck in the spiderweb”, but overall, most people got caught up with the “Scarecrow”. A single cone barely visible while looking ahead, located between the Witch’s Brew and Zombie’s Revenge, it was responsible for more than one fatal cone call on the course. The competition was pretty heavy, and several class championships were decided by the results of this event. Fast time of day was set by Jared Langenfeld in KM with a time of 43.250 sec, the next fastest time was a full four seconds slower. Fast fender time was set by Ron Williams in BSP at 47.699 sec, next was just under a second behind. Most times were in the mid to low 50-second range. 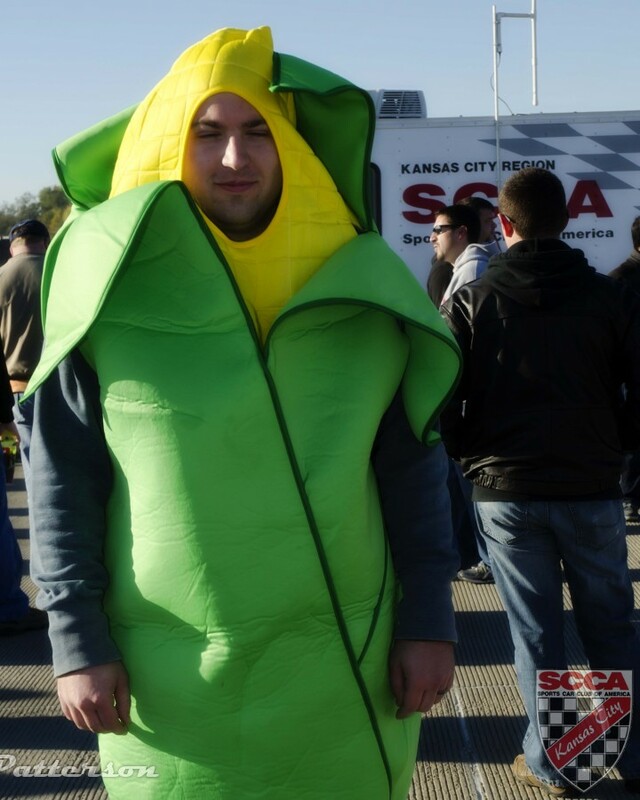 The costume contest drew quite a few contestants, in both the car and person category. Melanie Cahill, Georgia Finks and Donna Hill judged. Winners were given one free event entry for the 2014 season, as well as a custom made trophy. Winners in the person category were Paula Diehl as Elvira, Tyler Gibson as corn, and Alexander Hesskamp’s Minecraft costume. In the car category- Alicia Cost’s Miata, Sam and Janna Hitchcock’s junior kart, and Adam Morris’ Civic were judged to be the best. All through the day, there was great food to eat. The main course was hamburgers and hot dogs provided by the Region, and everyone who attended was asked to bring some sort of side dish. Two 8-foot tables were completely filled with food. It was a great buffet-style set up with everything from chips and dip to some secret family recipes. No one went away hungry or thirsty. Doug Patterson of Patterson Prints donated an amazing photo of the Indianapolis Motor Speedway Pagoda as well as a voucher for a print of a driver’s car in action for the silent auction, all proceeds to benefit the Raytown Economic Assistance Program (REAP). In addition to that donation, there was also a 50/50 raffle and canned food drive to benefit REAP. All in all, I would say this was a great event. I really have to hand it to everyone who attended for quick heat change overs, excellent incident management, and no drama. It wouldn’t have been great without the people who love the sport. 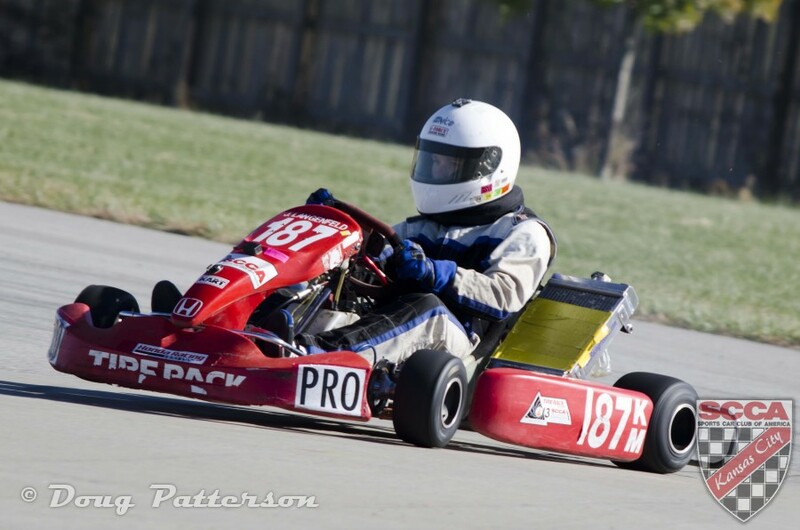 Tagged autocross, Event 12, Halloweenie, scca, solo. Bookmark the permalink.